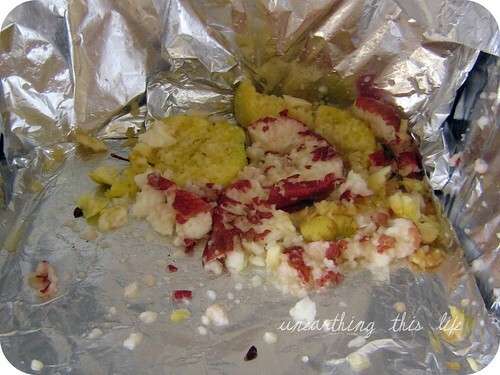 I have had a FoodSaver vacuum sealer for the over 10 years. Since I have been buying meat from local farmers and ranchers, I have hardly touched the vacuum sealer in the past 4 years. Over the past few weeks I have been doing a lot of planning ahead and pre-making some foods that will save me some time over the next few months. I will be having surgery and out of commission for a while and unable to spend time doing the things I normally do, like cook and garden. I will have lots of help to get me through the first few weeks, then the house will be back to the two of us. I want to do what I can now to be prepared and make the time easier on everyone, including me. So, I have been baking bread with onion, sage and oregano to make into stuffing and making bread crumbs. I have been stocking up on dry beans and grains (and cat food and cat little!) I have been drying more of my own herbs. I keep many of the dry herbs in the freezer to help keep them fresh. I have seen the jar sealers from FoodSaver and was curious about how they worked, but I couldn’t find anyone that had used them. I finally just took the plunge and bought both the jar sealer for the regular canning jar and the wide mouth canning jar (actually it was one of those practical Christmas presents that I ordered and told my husband he bought me for Christmas!) Hey, that works for us and I love those type of gifts. I was so excited to receive the jar sealers that I have been on a vacuum-sealing spree and loving loving loving it. I have pulled all my dry herbs out of the freezer and vacuum-sealed them in canning jars. Most of the things in our cupboards are in glass jars, but I decided to switch them out into canning jars so that I could vacuum seal them. 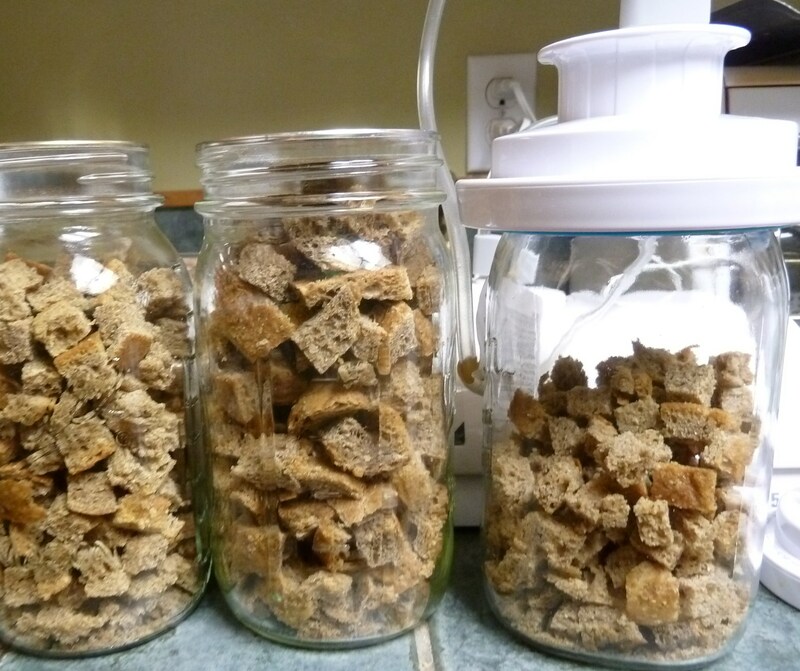 You may remember that I have an obsession with jars…. well, all those jars really came in handy. I have gone through my soap/lotion-making cabinet and vacuum sealed the elderflower, the calendula and many other dry herbs. 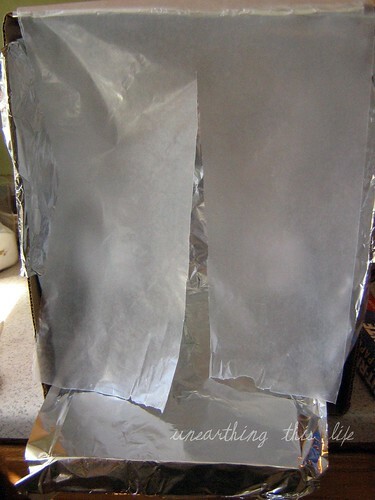 Next on my list is making crackers and getting those all vacuum sealed to retain freshness. When sealing anything in jars, just make sure it is completely dry. 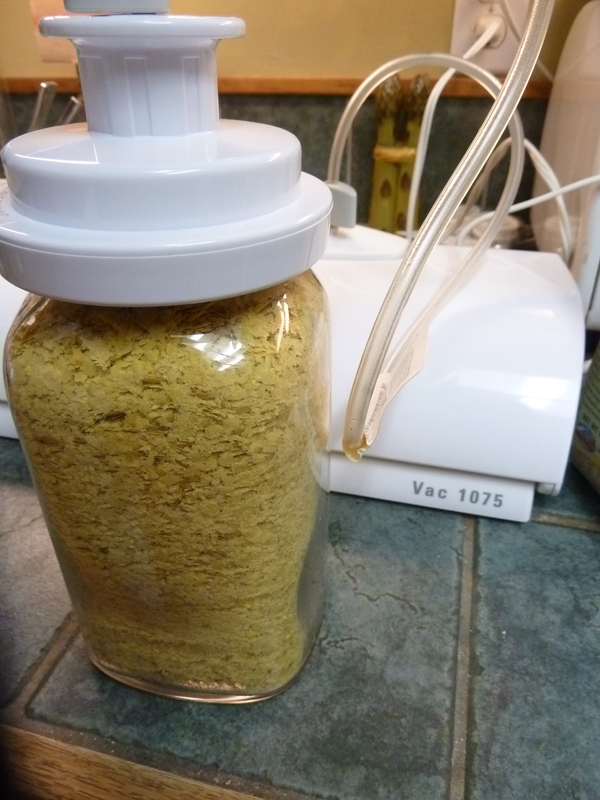 If there is any moisture and you vacuum seal your jars, you items will not be fresh. 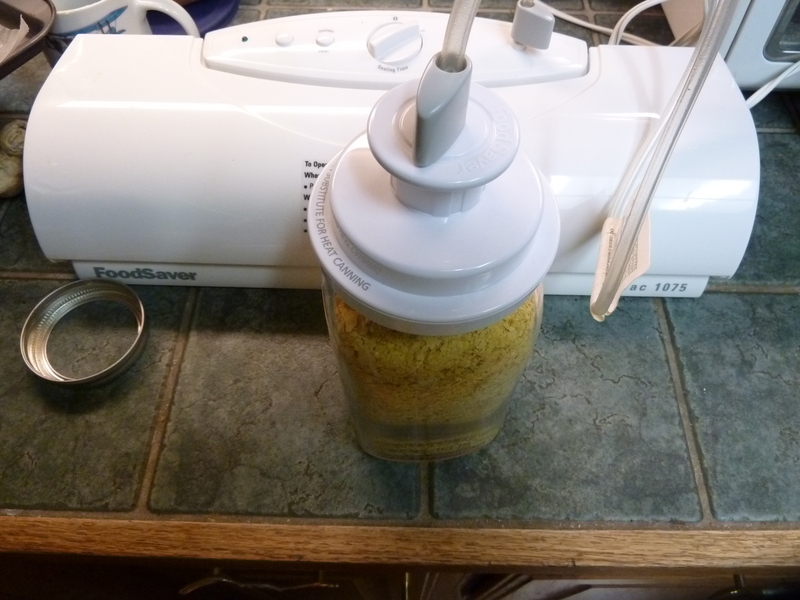 I have not had these jar sealer for long, but so far I am thrilled with how they work and how easily the jars seal. I love that all the air gets sucked out and that means the contents should stay super fresh for a very long time. I think these jar sealers make sense if you buy things in bulk, if you are planning ahead, if you are living in a humid climate and you want to extend the shelf life of you food. It all ties in with my frugal nature and trying to plan ahead and be prepared. Have you used any jar sealers? I would love to hear how they work for you and how you like using them. I have zucchini. This is happiness to me. The story is, I can’t seem to grow zucchini at all. The dang squash vine borers are horrible. So I out smarted them and planted zucchini in my neighbors garden. We watched the plant grown and develop beautiful leaves. Watched the flowers open and then the little zucchinis start to develop. In the blink of an eye – shazam – it was time to harvest (you know how sneaky that zucchini can be!) The plants are loaded and I had to leave town! No kidding. All that waiting. The thrill to watch the zucchini start to develop and grow… and I leave town. My neighbors aren’t interested in eating zucchini, in fact, they have never had it before, but they will pick and shred it for me while I am gone. So, I promise to bake them zucchini bread. I promise to stir fry some for them. Promise Promise promise. It will be great (I love zucchini!) 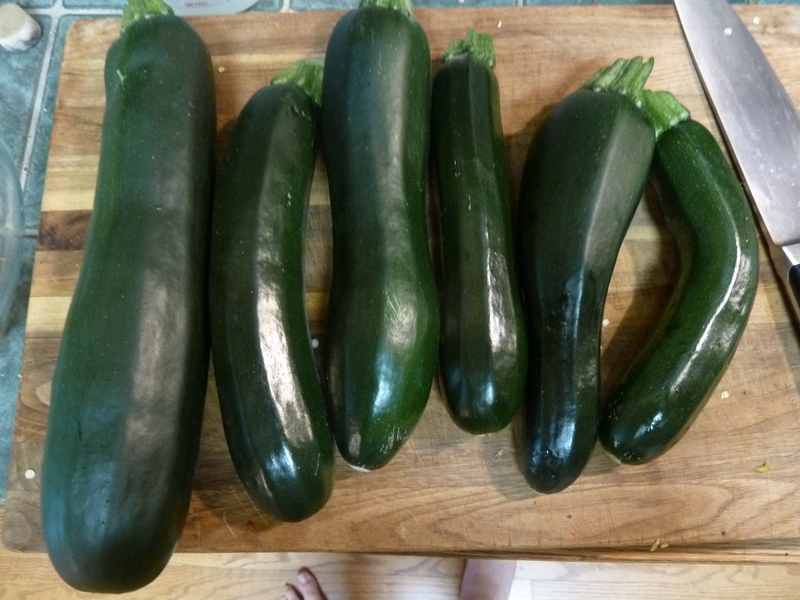 I picked the zucchini in the above photo the day before I left town. I shredded them and stashed it in the freezer. I am dreaming of zucchini fritters or poor mans crab cakes. I am dreaming of zucchini in my spaghetti sauce. Oh, I am dreaming of zucchini bread. 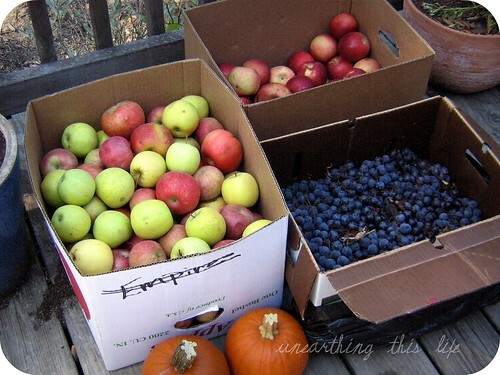 How are you preserving your fall harvests? 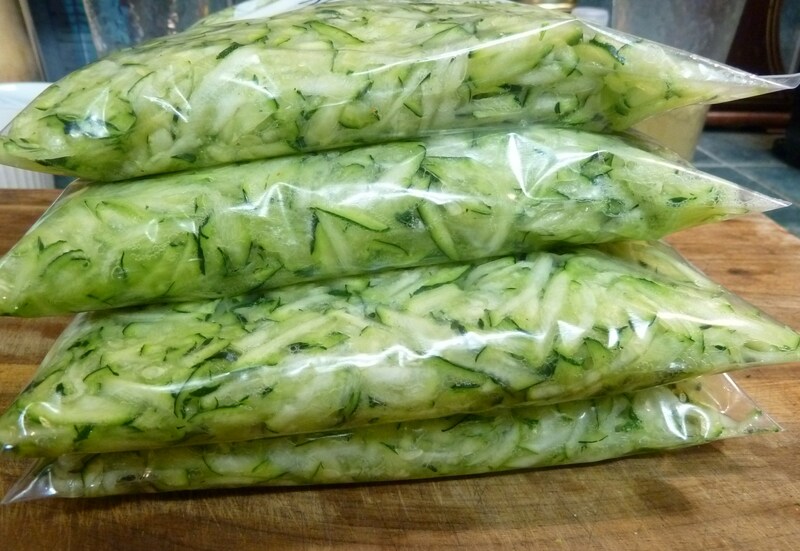 How about your zucchini… How do you preserve that so you can use it later? What Do You Save For Later? It used to be all that I’d preserve was tomatoes. After a few years of that I started freezing apples and peaches that I’d purchased by the bushel. When we moved to our current property we were loaded with wild blackberries, so preserves and jams obviously had to go on the list. Now, after almost 10 years of canning, freezing, and putting by for the winter, we have a pretty good stash of goodies that help us get through until it’s time to start harvesting wild and gardened foods again. This year we put up tomatoes, chow chow, several types of fruit preserves, honey & pecans, chutney, pear and lemon preserves. We froze roasted red peppers, squash, and pumpkins, as well as a half of a pig we processed ourselves. We have onions, potatoes, winter squash, and sugar pumpkins in dry storage, and we recently joined a meat CSA. We also have dried herbs for seasonings and teas – things like sumac berries, lemon balm, and mints. And finally, I managed to save some of those wines that I brewed (hic). I almost feel like we’ll be cheating for this year’s Real Food Challenge (Don’t forget to sign up if you’ll be joining us)! So, of those of you that will be playing along this next month – what will you be falling back on that you “put by” this past year? 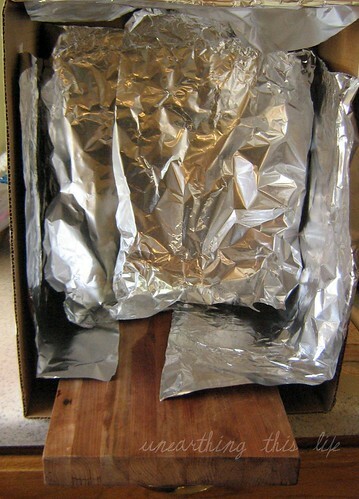 Do you mainly can, freeze, use a dry storage system like a cellar? Or will you have to start from scratch and pick up your supplies from stores and growers? You can also find Jennifer blarging away at Unearthing This Life. There she rambles on about chickens, organic food, gardening, and living in rural Tennessee. As we look toward a long season of harvesting I find myself excited about what we’ll be making. I wonder if we’ll have good crops and if I’ll be successful at storing food to eat throughout the winter months. The Real Food Challenge proved just how difficult it can be to commit to eating non-processed foods in late winter, especially if one is relying on regional or seasonal foods. Today I had the opportunity to visit the Amish and Mennonite society not far from my home. They have a rather large community and a fabulous relationship with the rest of the outlying region. My daughter and I drove by all the farms, amazed at all of the produce and canned items they have to sell. Most households offered squash, cabbage, and broccoli, but a few already had some tomatoes to spare. Fresh eggs, fresh milk, homemade butter, roosters and pullets, sorghum and honey – so much to be had. I found myself wondering how they get through the winter months without canned vegetable Blahs (they keep greenhouses and cellars and plan ahead!). I have nothing but admiration for their culture and I respect their relationship with the earth. I love that they have such a healthy relationship with food. They obviously adore food (which is apparent by the way they treat what they grow) but not one of them is overweight. That’s seasonal eating for you. That’s a very, very limited access to processed foods. That’s working with the earth. The Kid and I had the chance to go to the Amish auction. It was thrilling to see green peppers, tomatoes, and even blackberries. 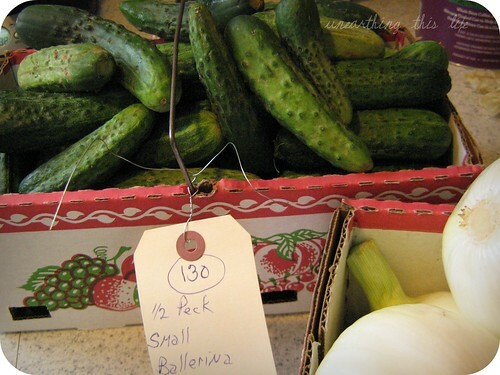 I purchased a half peck each of pickles and huge candy onions as well as a large bunch of carrots for only $11. I now have 2 gallons worth of refrigerator pickles working their magic, and we’ve already broken into the onions – onions so sweet you can eat them like an apple. And those carrots! Wow. I know we’ll visit over and over again during the summer. Our diets will be supplemented by Amish wares. And if my garden doesn’t produce like I hope, well those Amish wares will be what we’ll eat during those late winter months. If you ever have the opportunity to visit this kind of culture, do so! I highly recommend visiting the homes or auction sites to purchase merchandise rather than going to a store that carries “Amish-made” items. Going directly to the site will not only cost you less, but it ensures that the families are getting 100% of the profit. Do you have an Amish and/or Mennonite society nearby that offers merchandise to the public? Jennifer can also be found over at Unearthing this Life where she blargs about living in rural Tennessee, raising a precocious yet sweet daughter, and growing her own food. I posted this picture a week ago on my blog, and I am still getting questions about how my berries come out of the freezer in berry shape, and not mushy. And since I am pressed for time (milking two cows instead of one) I thought I would kill two birds with one stone and answer here since I cannot think of a single thing interesting to write about! Anyone over the age of about 40 living in the Pacific Northwest probably had to pick berries for a summer job. I started at age 9 and picked all types of berries until I could get a job at the local tourist trap, Multnomah Falls. To be a good berry picker we had to be careful with the berries, if we turned in mushy, dirty or unripe berries our meager pay was docked. Wanting to earn money to fuel my jerky and comic book habit, I was careful with my bumper. The cans we picked in were called bumpers, but they were actually No. 10 cans with holes cut in them and a rope to tie around your waist. We were instructed to not bounce the can on our legs, and to take it off when taking it to the crate to dump, so as not to jostle the berries. Our procedure for freezing raspberries (or any berries for that matter) is pretty simple: we pick a can and then gently place the berries in freezer bags immediately, and freeze. I do not wash the berries, and I don’t mess with individually freezing them on cookie sheets. ♥ Pick in a small enough container that your berries don’t get crushed. ♥ If you are picking at a u-pick farm, place your berries in shallow crates or boxes for transporting home. 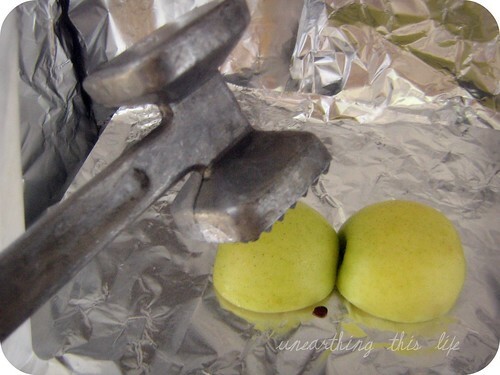 ♥ Plan on dealing with them right away – a hot summer day in the trunk of car can be murder on soft fruits. Make the berry picking/buying your last stop of the day. ♥ If you’re just planning your berry garden, read the descriptions carefully, you may want to buy a variety that touts it’s processing qualities. In berry lingo, good for processing usually means a concentrated crop and a firm berry. Don’t worry about sacrificing taste for good processing quality – I don’t think anyone who likes to eat berries has met one that doesn’t taste good. And they taste especially good in the winter when summer is just memory we are clinging to. Cassandra’s Question: I have some multiplier onions that I have been harvesting as-needed for the past couple of months. I can tell they are about to go to seed. I plan on saving some for my next planting. I have many that I need to pick for eating. How can I preserve them? I have been told that onions don’t freeze well (aside from flash freezing.) How would they dehydrate, do you think? How else can I save them? Kristine’s Answer: I LOVE dehydrated onions. I slice them in rings, put them on the dehydrator and rotate until dry. They are so sweet and tasty, its easy to eat them all up just as they are! Otherwise, we throw them in some hot water to regenerate them and add them to any dish we are cooking. To store them, we place them in a glass jar and store in a cool, dark place. Kathie’s Answer:I like them dehydrated too, just like Kristine said. French onion soup freezes well, its also something that’s easy to make in big batches. Simply make it according to your favorite recipe and freeze before you get to the step where you add croutons and cheese. Add the croutons and cheese when you heat and serve. You can also make and can things like pickled onions, onion relish, and many chutneys include onions (but they may also include other things that aren’t in season right now).